In conventional electronics, a significant amount of effort is put into removing stochastic resonance (SR) - the frustrating hiss that by and large obstructs the detection of weak signals and degrades total device performance. But, what if there were a means to making use of this effect to improve signal transmission for a new generation of devices, such as bio-inspired sensors and computing processors whose design is based on the neural system of the brain? A team of researchers at Osaka University in Japan are aiming to accomplish just that, using single-walled carbon nanotubes (SWNTs). They developed a summing network SR device that detects subthreshold signals, created to include a self-noise component. The researchers report their findings in the journal Applied Physics Letters, from AIP Publishing. The functional capabilities of our network SR device, which relies on dense nanomaterials and exploits intrinsic spontaneous noise at room temperature, offer a glimpse of future bio-inspired electronic devices. Scientists have known for long that certain animals use SR to improve the transmission or detection of signals below the detection threshold. Paddle fish living in muddy rivers, for instance, can detect, and thereby feed on, the nearest plankton only when there is background electrical noise resonating from another plankton mass. The background noise is used to intensify the signals of the adjacent plankton. SR is also used by crayfish, where SR is part of the mechanical noise in water, to detect slight movements of predators. There is also proof that the human brain applies SR in visual processing. Undetectable light signals to the right eye become detectable via the inclusion of noise to the left eye. Of late, Researchers have found out that inclusion of random noise such as SR, in the right way, to electronic devices can boost the detectability of signals and the transmission efficiency of information. There are two standard requirements for creating an SR-based electronic device: a signal detection threshold and the presence of extra noise. 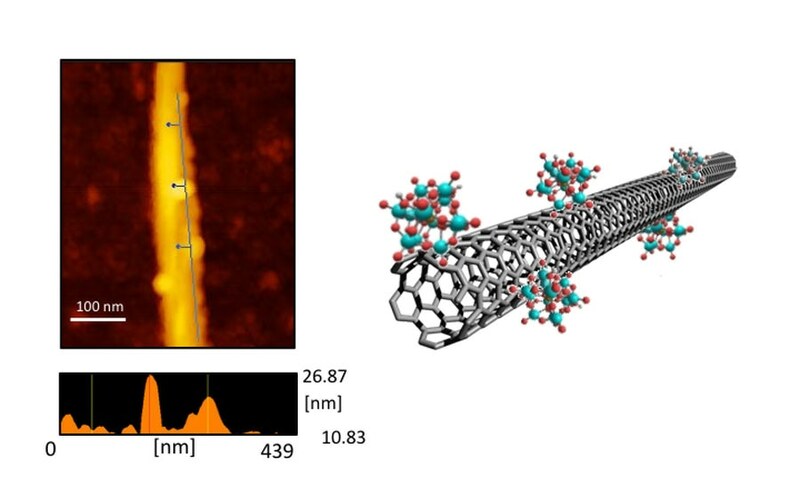 To suit these requirements in their SWNT device, the research team developed a SWNT network in which up to 300 carbon nanotubes were arranged parallel to each other between chromium electrodes, which enhanced the signal detection ability. They functionalized the SWNTs with phosphomolybdic acid (PMo12) molecules, which can resolutely adsorb on graphite materials, before drying the device on a hotplate at 150 °C under atmospheric pressure. The adsorption of the PMo12 molecules on the SWNTs produced extra noise. SWNTs can be generators of spontaneous noise, owing to their high sensitivity to external surface perturbation. What we found is that the introduction of an extra disruptor -- molecular adsorption, and particularly with the adsorption of PMo12 - generated a large and tunable type of electrical noise in addition to common environmental noise. The team analyzed 10 diverse molecules adsorbed in the SWNTs as noise generators and discovered that the SWNT/PMo12 combination was more than twice as valuable as the other SWNT functionalized combinations. SWNTs offer a promising route to realizing a small-size summing network SR device that utilizes molecular thermal fluctuation as the noise source.